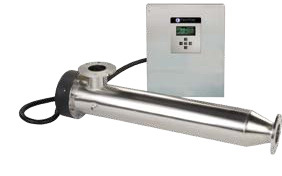 The TrojanUVLogic Series is a robust, highly versatile UV water treatment system with broad capabilities for many industrial applications. Available in numerous configurations, it has proven its reliability in thousands of installations worldwide. The series features the industry’s most advanced low-pressure, high-output (LPHO) amalgam lamp technology and utilizes this advancement as an efficient and cost effective alternative across multiple applications. As a result, TrojanUVLogic systems require only one-third the number of lamps to deliver a dose equivalent to those of conventional systems. The “L-shaped” reactor design was developed using advanced computer modeling, resulting in 40% greater hydraulic efficiency than conventional systems. Compact in size and with the ability to be mounted horizontally or vertically, the TrojanUVLogic maximizes installation flexibility and preserves precious floor space.Single-ended lamps and quartz sleeves allow fast lamp change-outs without tools and feature an optional manual or automated sleeve cleaning system which can be operated while the reactor is online. In addition to a comprehensive list of standard features, each system undergoes rigorous quality checks and electronic functionality and hydrostatic pressure testing before leaving our facility. The TrojanUVLogic Series consists of a 316L stainless steel treatment chamber and a UL TYPE-3R 304 stainless steel control cabinet featuring a microprocessor-based controller. A maximum cable length of 15 feet (5m) is available. The compact size maximizes installation flexibility and preserves floor space with the ability to mount in line, horizontally or vertically. Single-ended lamps and quartz sleeves allow quick change-outs without tools. * Disinfection Dose Level: 30 mJ/cm2 after 9,000 hours of operation. (up to 1.0 ppm of ozone). *** Disinfection Dose Level: 32 mJ/cm2 after 9,000 hours of operation. ^ Disinfection Dose Level: 39 mJ/cm2 after 9,000 hours of operation. ^^ Disinfection Dose Level: 47 mJ/cm2 after 9,000 hours of operation. NOTE: Flow rates are restricted due to maximum I/O velocities.